I bought the first Lucifer album on the strength of its debut single, “Izrael”, and the stellar vocals of frontwoman Johanna Sadonis. Unfortunately, there was only one other track on said album that grabbed me (lead-off number “Abracadabra”). The rest wasn’t bad, it just wasn’t all that interesting. For the project’s second outing, only Sadonis remains from the original lineup. The most notable new recruit is Nicke Andersson (Entombed, The Hellacopters) on guitar and drums. From the very first track, “California Son”, it’s obvious Mr. Andersson’s songwriting skills have been well utilized. 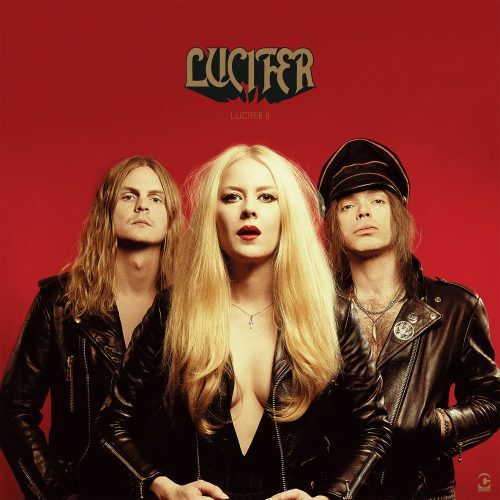 Even when he blatantly steals the signature clean guitar riff from Black Sabbath’s “Children of the Sea” for Lucifer’s “Dreamer”, it’s put to such good use that I’m willing to forgive his musical larceny. Third track “Phoenix” sounds like something that could have wound up on a later period Hellacopters album. But while Andersson’s involvement has taken the band to another level, it’s still Johanna Sadonis’ vocals that are the real draw. It’s just that this time around she has a stronger and more diverse batch of material on which to put her talent to use. The band’s satisfyingly doomy take on the Rolling Stones “Dancin’ With Mr. D.” comes in at the halfway point, but have no fear: they haven’t run out of good songs of their own by a long shot, as the bluesy “Reaper on Your Heels” is quick to announce. “Eyes in the Sky” starts off like something off the first album, slower and sludgier, before shifting gears into uptempo seventies rock. “Before the Sun” and “Aton” are a pair of slower, bluesy numbers with strong vocals melodies. Finally the album closes with the sludgy doomfest “Faux Pharoah”. It’s the closest thing on here to the first album, but it still bears Andersson’s distinctive songwriting mark. If you were hoping for another monolithic exercise in stoner doom like the band’s debut, this may not be for you. The doom leanings are still present, but they’ve been tempered with a whole host of other seventies rock sounds, even going so far as to incorporate non-hard rock influences like Buckingham/Nicks era Fleetwood Mac. Lucifer doesn’t take that aesthetic quite as far as, say, Church of the Cosmic Skull, but it’s definitely there. For me, the change is a winner, though, and I hope this version of the band sticks around for a while. 4 out of 5 stars.